All floor materials, including carpet, tile and hardwoods, require routine maintenance to keep them looking their best and functioning well. Taking good care of your hardwood floor finish will protect the wood and keep your home or commercial space looking beautiful for years. Deep cleaning and removing buildup at least twice each year is the first step in protecting and maintaining your floors. With daily use, however, even a professionally applied finish will begin to show wear. Recoating is just what it sounds like: adding a new layer of polyurethane coating to your floor. Generally, you should recoat every 3-5 years, depending on the amount of use your floors see. You’ll know it’s time to recoat when the floor looks dull and there are light scratches in the finish that aren’t removed by a deep clean and polish. Recoating will help extend the life of your floor’s finish by protecting the wood from deep scratches that require refinishing to remove. Recoating also helps reduce the number of times you’ll need to refinish your floors over their lifetime. During recoating, the top layer of finish is lightly sanded to remove scuffs. A new layer of polyurethane is then added to improve your floor’s sheen and renew the protective properties of the finish. 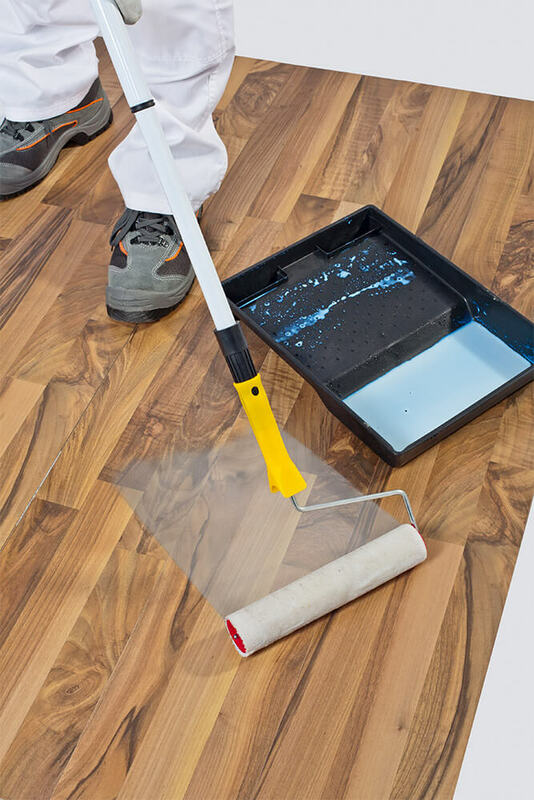 The entire process typically takes about a day, and you should be able to walk on your floor within just a few hours, if using water base polyurethane or the next day, if using oil base polyurethane. If floors have deep scratches or stains that have penetrated the polyurethane finish, or discoloration due to sunlight or age, refinishing is necessary to restore the wood’s beauty and protect it from drying and cracking. Refinishing hardwood floors is a complex process that should only be undertaken by a professional or very skilled DIYers. It’s very easy to damage your floors through improper use of equipment or the application of the wrong finish. We frequently get frantic calls from well-meaning homeowners who believe they’ve ruined their floors. We can almost always fix the mistakes, but why take the chance? Floor refinishing requires a heavy sanding to remove all finishes and to take off enough wood to remove scratches and discolorations. We use a dustless sanding process that removes nearly 100% of dust from the air. After sanding, the floors are stained and then we apply the recommended number of coats of polyurethane, allowing each coat to dry completely and lightly sanding before adding the next (to promote adherence of the coats). After the final coat is complete, you’ll need to wait a day before you (or your pets) can walk on your new floors. If you choose a waterbase polyurethane, you can “lightly” walk on your floors the same day. Furniture can be placed on the floors at this time, but you should wait to replace rugs for at least one week. Live in Atlanta? We’re always here to help with your questions and, of course, we’re standing by to provide all of your hardwood floor maintenance and installation needs. Check out our services page to see what we offer, and our specials page for some great deals.